Wandermelon and Exclusively New Zealand have designed the ultimate road trip around the North and South Islands to bring you the best that the land of the long cloud has to offer, uniquely and exclusively for you. We’ve partnered with Excursionist.com to bring you an unforgettable itinerary exploring Hawaii’s best beaches, wellness traditions and off-the-map adventures. Imagine the world’s most gorgeous lagoon. Now add world-class watersports competitions, beachfront parties, and a celebration of Tahitian culture with a few hundred new local friends. The only thing missing is you! 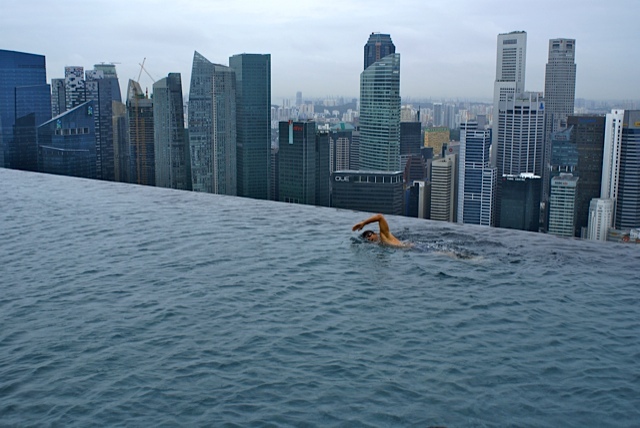 World-class competitive swimmer Alex Kostich goes in search of the world’s splashiest swimming pools and comes up with five gold medalists. 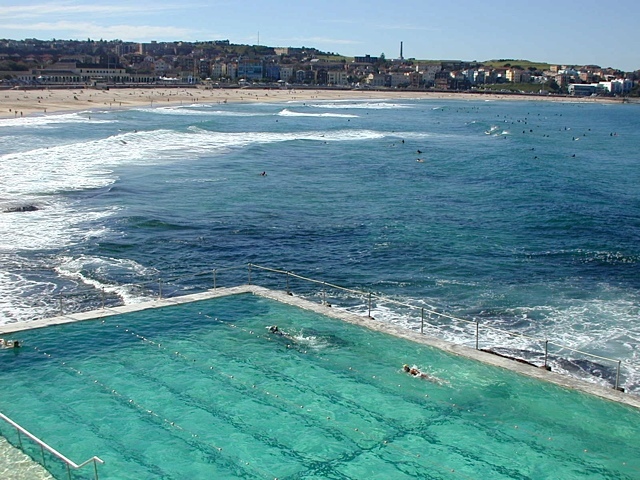 It’s the middle of the summer and the dog days are upon us; beach parking is virtually non-existent, and your hotel pool is full of cannonball-ing kids and ominous patches of cloudy sunscreen. 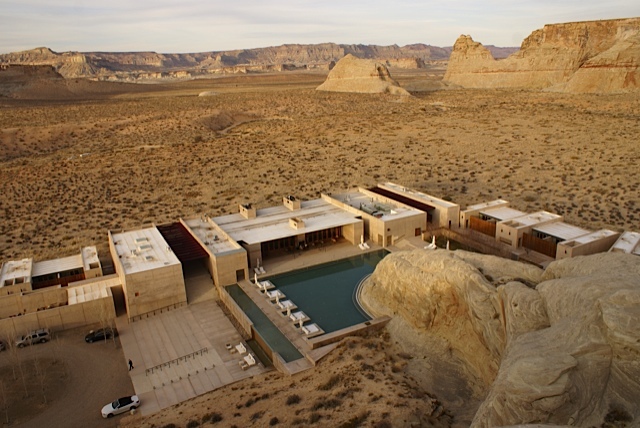 It may be time to take a vacation… from your vacation. 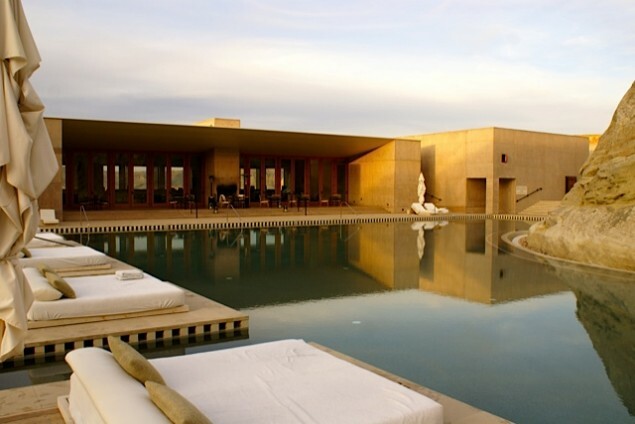 For those yearning for a unique and unparalleled aquatic experience, why not immerse in some of the world’s most awesome swimming pools? While “awesome” may be a word carelessly overused in the last two decades, its’ simple definition (‘to inspire awe,’ ‘to appear very impressive’) can still succinctly describe the feeling of seeing something incredible for the first time. 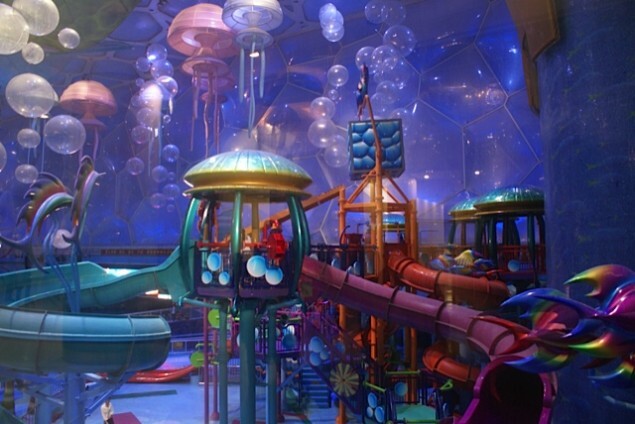 So what defines a swimming pool as rightfully ‘awesome’? It could be the size. It could be the location. It could be the marvel of engineering required to contain its’ cooling body of water. Or it could simply be the indescribable feeling you might get when you see it for the first time…and it takes every ounce of willpower not to spontaneously plunge into its waters with all your clothes on. 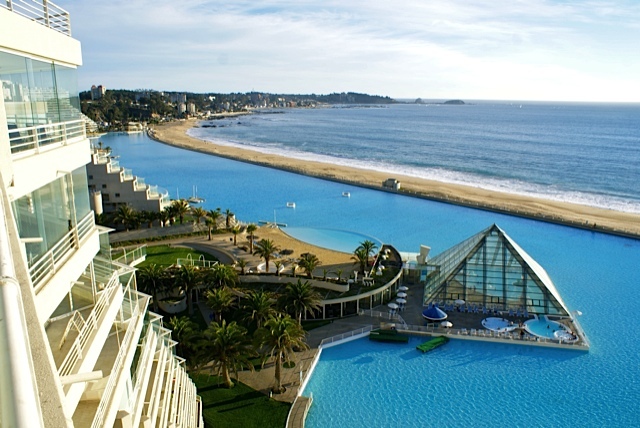 Whether you’re looking to book your next trip or you simply need a virtual vacation from the confines of your cubicle, here are five of the most incredibly awesome man-made pools to be found on the planet. 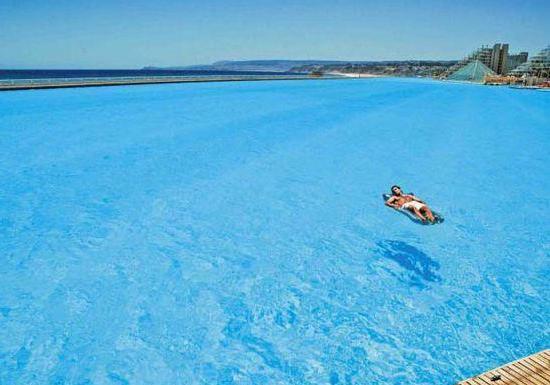 This gigantic $1.6 billion concrete-lined lagoon on the coast of Chile holds the distinction of being the world’s largest man-made pool (in addition to the most expensive). Over 1 kilometer long and 115 feet deep in parts, it borders the Pacific on one side and a cluster of high-end condominiums on the other. Seawater is sucked in from the ocean via complex circulation pumps, while it is kept impossibly clean through a technologically advanced filtration system and traditional pool cleaners (men can be seen brushing the pool-sides for algae in the early morning hours). Private access to the facility limits the patrons to property owners and their guests, although intrepid travelers can find locals online who sublet their pool-front condominiums to vacationing foreigners. Keep in mind the pool is only marginally warmer than the ocean which feeds it, so time your trip during the Southern Hemisphere’s summer months (November-February). 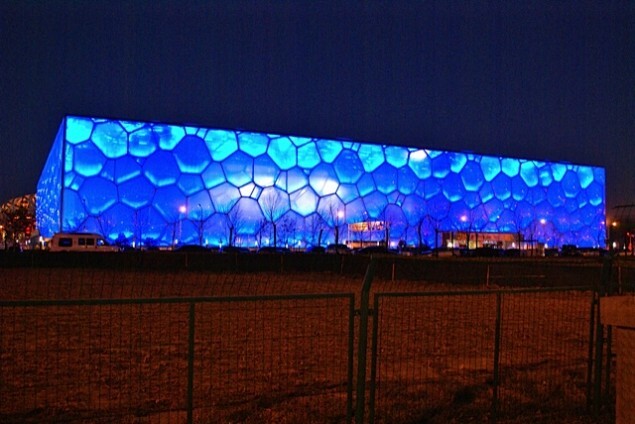 Familiar to anyone who watched Michael Phelps make history at the 2008 Beijing Olympics, this facility (built by a consortium of Australian, Chinese, and other carefully selected International engineers/architects) is most visually striking from the outside. A surreal rectangle of seemingly transparent bubbles, the shell of this natatorium has not only become a symbol of the Beijing Games but an icon of Chinese national pride. Following the 25 world records that were broken there in the summer of 2008, the pool was partially converted into an aquatic theme park with several waterslide attractions and Chihuly-esque jellyfish chandeliers suspended from the ceiling. Swimmers will still find a lap pool in a corner of the complex (formerly the Olympians’ pre-event warm-up pool), while the former competition site is currently under reconstruction. Swim fans will be pleased to know that a pass is required to enter the facility, which can be processed while you wait for about $40. It is a laminated ID card similar to a driver’s license complete with an accompanying photo of Michael Phelps alongside your mugshot…and it’s good for life. 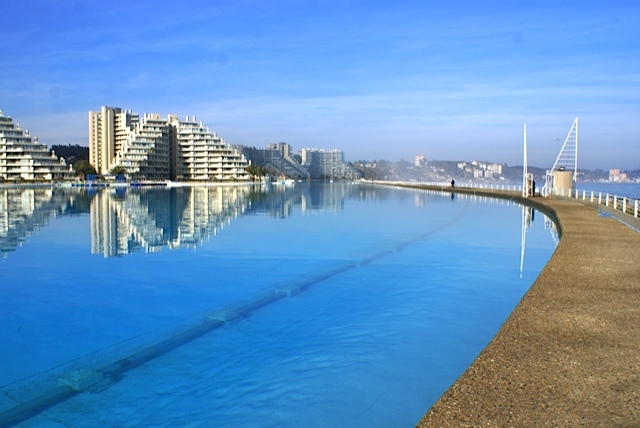 Not necessarily the most spectacular pool at first glance, the Icebergs is more of a destination for thrill-seekers who want to brave the elements and claim bragging rights to their aquatically-inclined friends. 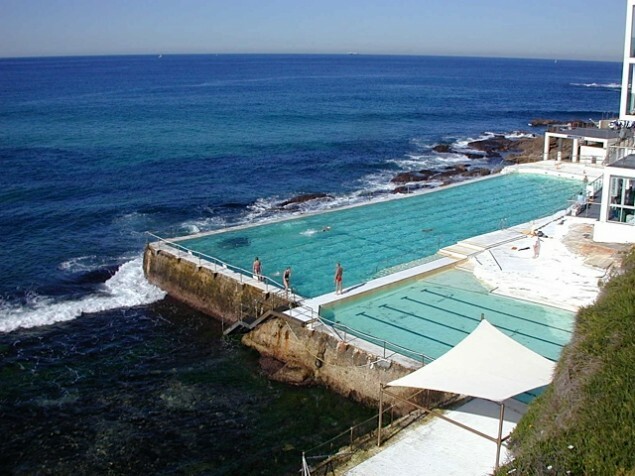 Often slammed by powerful and frigid waves from the neighboring Bondi beach, this outdoor complex is well-known in swimming circles for its open-year-round policy as well as its nearby natural water source (the Tasman Sea). Dipping one toe in the water will answer any questions you have as to the origins of the Icebergs moniker, and if you last more than a few minutes you’ve more than earned the right to a cocktail (warm or otherwise) of your choice at the chic bar overlooking the complex. A word to the wise: when practicing flip-turns it’s best to look before you plant your feet on the wall should an errant crab have its’ pincers up in defense. The Marina Bay Sands resort opened in Singapore exactly two years ago in June 2010, qualifying not only as having the newest pool on the list but also by far the most ‘awesome.’ A gravity-defying 150m ‘infinity pool’ linking three skyscrapers together by a rooftop platform is not only a tempting place to cool off for those unafraid of heights, but a mandatory photo opportunity for anyone visiting Singapore. 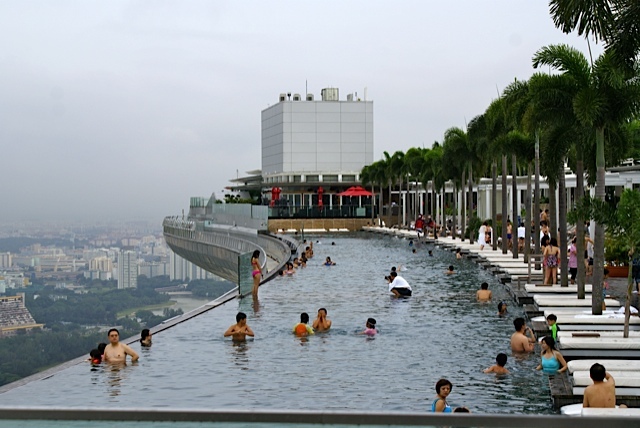 Access to the pool is limited to hotel guests, so be prepared to spend upwards of $300 for a chic tower room with the all-important Skypark pass. If you’re looking to do laps though, its best to go before sunrise as the pool starts to get crowded with tourists and would-be photographers at the first sign of dawn.